Congo Boards is a BodyBoard Shaper and Designer. We feature larger boards for Drop Knee and Stand-up. All of our boards are handmade in Oceanside Calif and distributed nationwide. 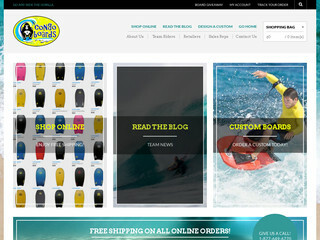 Check out our website at www.congoboards.com. We give a free BodyBoard away each month, just register to win on our site !! Visit the website of Congo Boards now ! Congo Boards , belonging to category "Bodyboarding Brands"